Sweet And Simple. Oven Dried Strawberries. I remember back in the old eating days and on my first trip to the USA, San Francisco to be exact, I came across cereal that had huge pieces of dried strawberries (as well as a bucket of sugar). It was so tasty and I’d make sure I got my share of the dried berries. On further visits I found the best fresh strawberries ever at Berkeley Farmers Market. Plenty of those were eaten however, I still loved those dried strawberries and often thought about them! 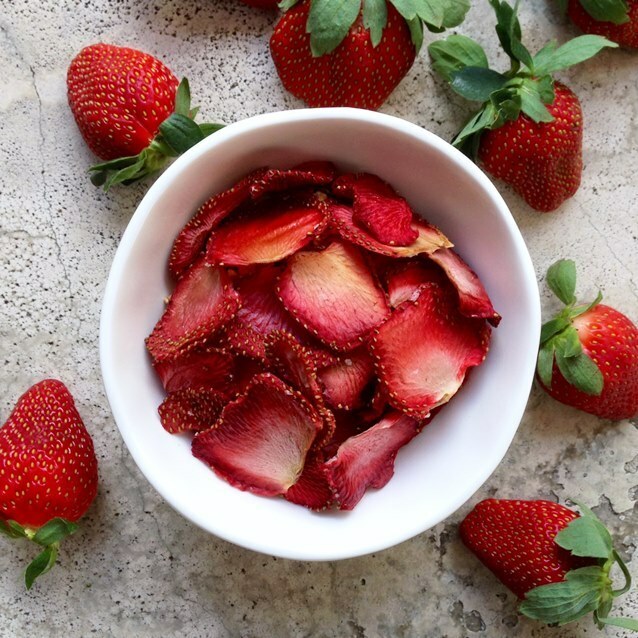 And as it just seems to happen sometime, like magic I discovered this post from The Paddington Foodie on how to make oven dried strawberries! I have to share this straight away even though in New Zealand we have a few more months to go before the strawberry season really gets underway. Can’t wait to dry my own and use them on my Nograinola! You need to gather together just 500g fresh strawberries & 1 teaspoon sea salt. Then head over to Paddington Foodie for the super easy instructions. Oven dried strawberries are something I’ve been wanting to try for ages. This week, almost serendipitously, the ideal opportunity presented itself with enormous kilo punnets of fragrant, perfectly ripe and juicy strawberries available at the markets from our Victorian growers. I’ve successfully dabbled in using my oven to make crisps before. My first foray was into oven baked beetroot crisps, followed by toffee drizzled apple slices, and more recently mandarin which although gorgeous on their own were pounded to a fine dust and incorporated into a spicy salt and sweet citrus sugar. Initially, I will confess, I was a little dubious as to how I would fare oven drying sweet, delicate strawberries. Would they disintegrate into a pulpy, jammy mess or worse lose their lovely vibrancy and crisp to an unappetising muddy colour?